Hello again from onboard the IBRV Araon. It has been a successful research cruise and we are now on our way back to Christchurch. 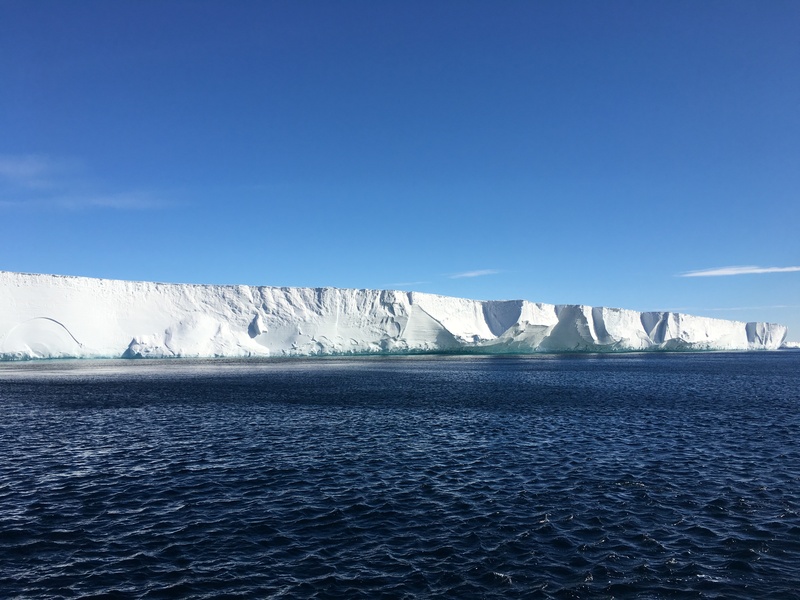 Here is a recap of the past few weeks of operations in the Ross Sea. An iceberg surrounded by sea ice at dusk. 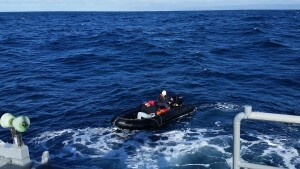 The IBRV Araon as seen from the work boat during glider operations. The face of the Nansen Ice Shelf with work boat in the foreground. After a few days of multibeam transects near Jang Bogo Station, it was time to move on to glider operations. On the morning of January 30th I was ecstatic to receive an invitation of a seat on the work boat to assist with glider work. 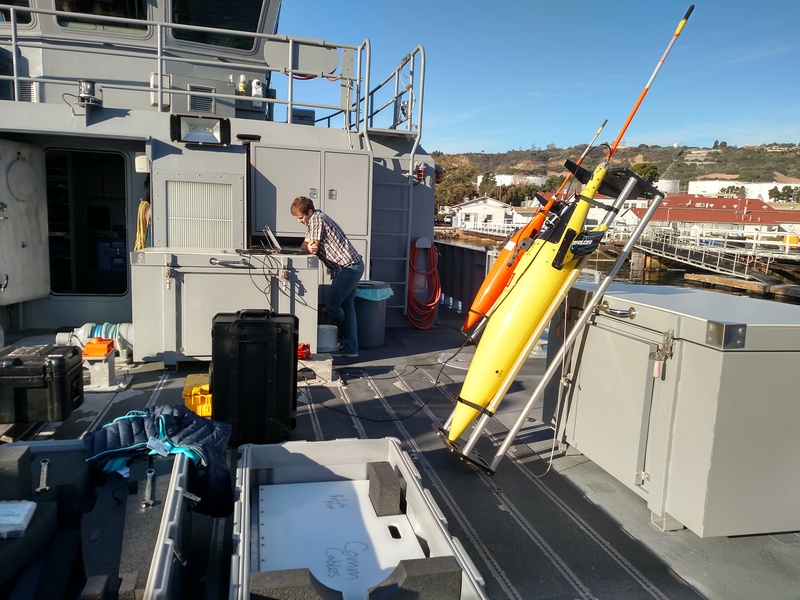 Damien (UTAS), Cassie (UNH), Nathan (Blue Ocean Monitoring), and I headed out on the water for a few hours to deploy their Slocum Glider (named “Storm Petrel”) while Alex (UCDavis) and Danielle (UDel) sent it commands from the Araon. They worked out a few kinks on these test dives to prepare it for a successful week-long deployment later in the cruise. I spent the next few days getting ready for my first deployments at the new northern site, which happened on February 5th. 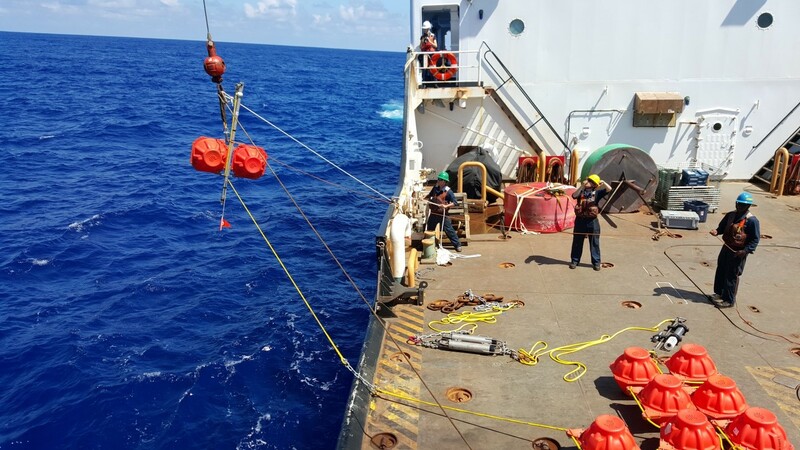 As we transited to the triad site the final preparations included craning the floats and anchors to the back deck, winding the mooring line onto the winch, and going over the deployment procedure one last time. For all of my deployments and recoveries I had a lot of great help on the deck from the Araon crew, the KOPRI scientists, and the other mooring techs onboard from NIWA and LDEO. The anchor and acoustic release (yellow cylinder) ready to go into the water as we steam to the drop site. The main components of our moorings from top to bottom are a syntactic foam float, a hydrophone, about 400 meters of polyester and nylon line, an acoustic release, and a railroad wheel anchor. 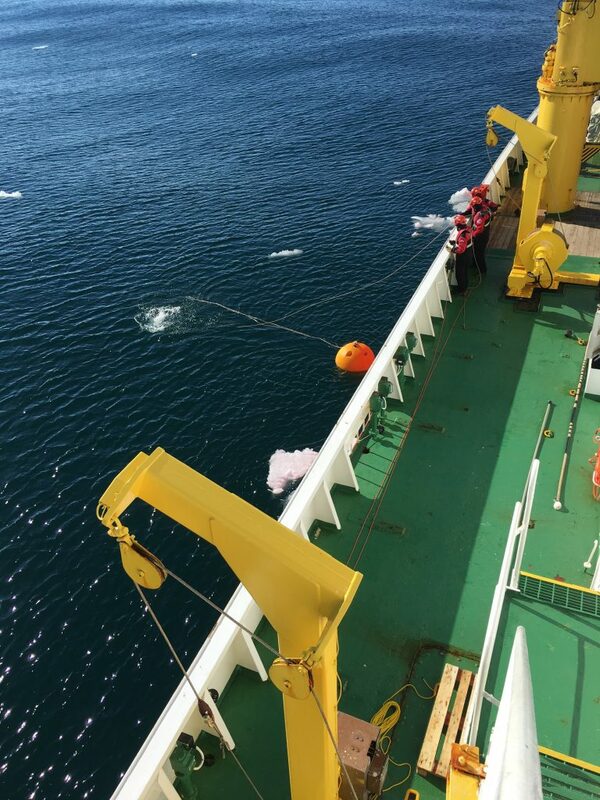 To start deployment, we first lift the float into the water, followed by the hydrophone, and then as the ship moves at a few knots the line is paid out straight behind the ship. Once we arrive at the deployment location, the acoustic release and anchor are lifted over the water and dropped. After the anchor drop the operation is complete and we begin the short transit to the next site. The three deployments take about 3-4 hours, after which I begin the second and last step: triangulation. 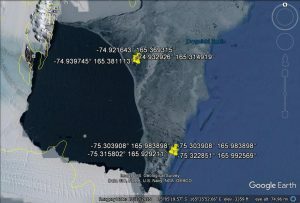 The locations of the two hydrophone triads with the Drygalski Ice Tongue in the bottom left corner. The northern triad is a new site this year; the southern triad is on its second year. We are building the two triads (50km apart) of three hydrophones each (2km apart) to allow us to estimate the locations of the sounds of interest, which in this dataset are icequakes, iceberg tremors, and other natural sounds in the polynya. To be able to do this accurately, we need to know the precise location of each hydrophone once the mooring has settled on the seafloor. Triangulation is performed by communicating with the acoustic release from a transducer that I place in the water over the side of the ship. The transducer sends and receives acoustic signals to and from the release and by measuring the time it takes for these signals to travel it can then calculate the distance to the release using the sound velocity. I use the transducer to range to the release at 4-5 points around the drop location and use a program called MCal to then determine the final coordinates and depth of the mooring. The triangulation process takes another 4-5 hours. These hydrophones will start recording in a few days and will be recovered on next year’s cruise. The next few days were filled with more mooring deployments. 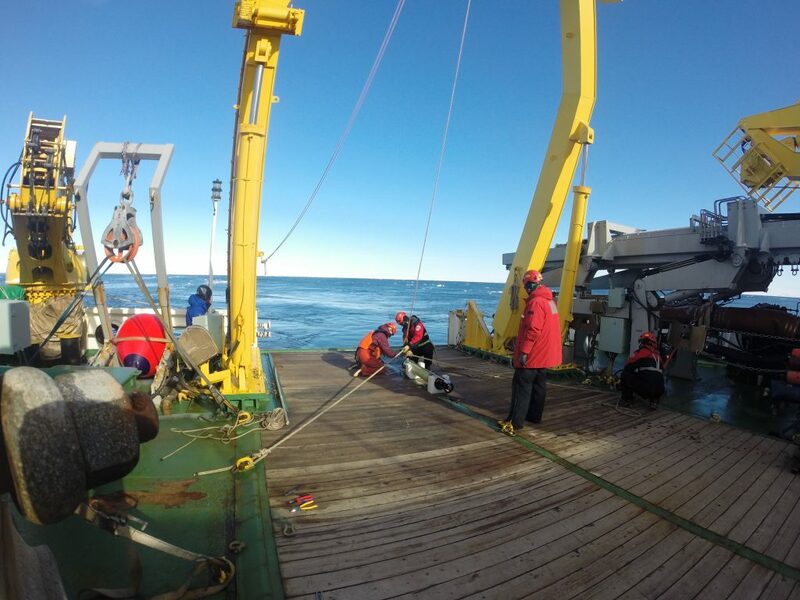 On the 6th Chris and Carson of LDEO deployed a mooring with 15 instruments that will record a time series of the outflow of the Nansen as well as the O2 and CO2 content caused by sea ice formation in the polynya. 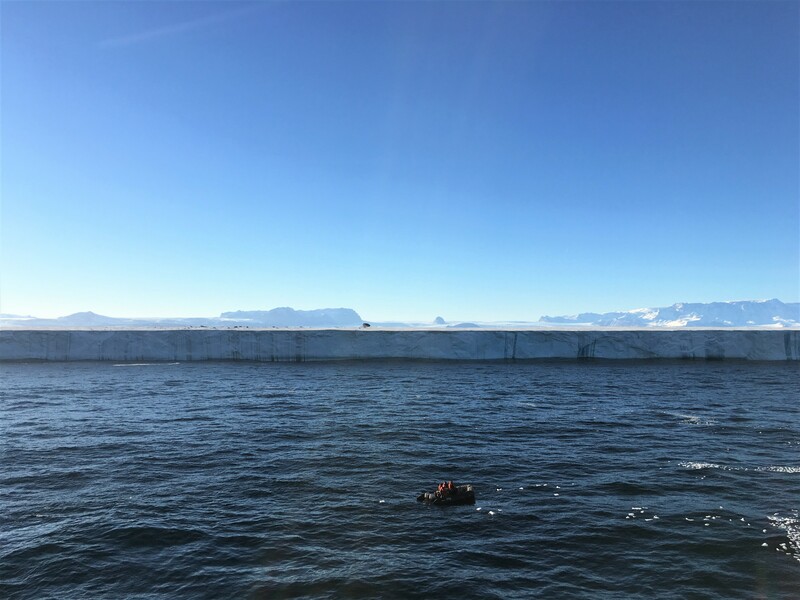 On the 8th Fiona of NIWA recovered and deployed moorings near the northern edge of the Drygalski ice tongue that measure the local buoyant currents. Then on the 9th it was time for more hydrophones. 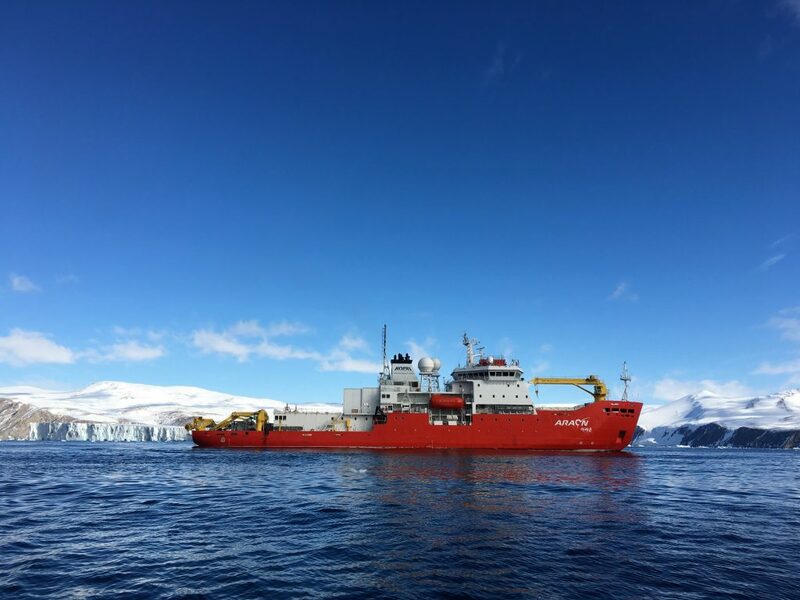 In December 2015, Sharon Nieukirk of the Acoustics Program sailed onboard the Araon down from Australia and deployed the triad near the Drygalski. In the year of data collected on these instruments, the highlights we expect are the sounds associated with the calving, or break off, of 10km and 20km long icebergs from the Nansen Ice Shelf. We will be sure to post what we find once we analyze the data! As we approached the 2015 triad, things were not looking so good. In every direction we were surrounded by thick sea ice, which isn’t a problem for the ship but makes mooring work very difficult. On top of that it was snowing heavily. But luckily, a dark line appeared on the horizon and we found the moorings to be situated right on the edge of the sea ice. The skies cleared as well and it became a beautiful day for deck work. 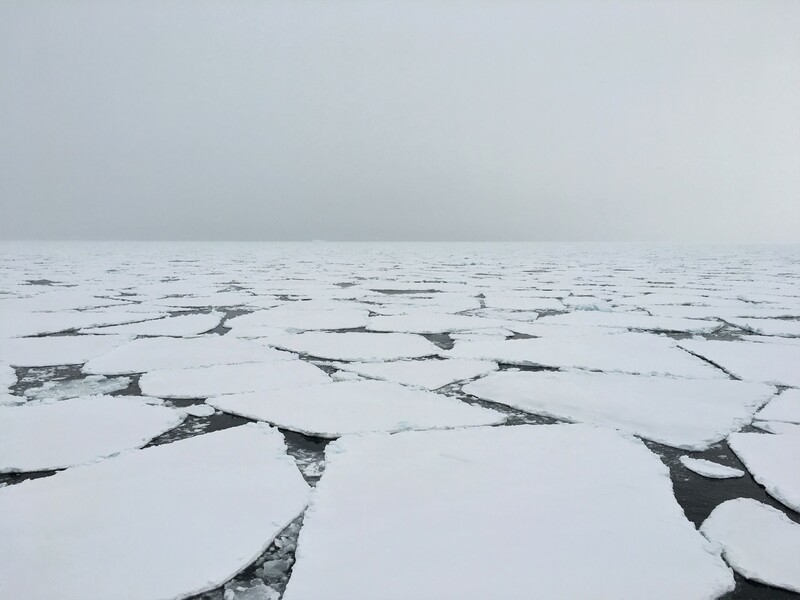 The sea ice conditions as we neared the hydrophone mooring location on February 9th. 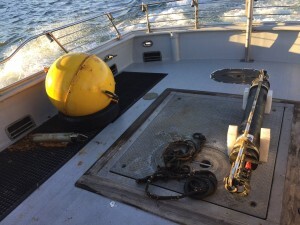 Detaching the hydrophone as a mooring is recovered. Photo by Carson Witte (LDEO). the mooring is about 500 meters from its starboard beam. 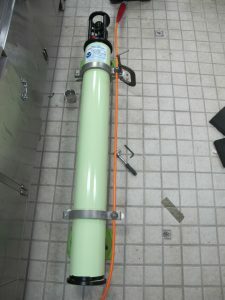 I lower the transducer over the side and establish communication with the acoustic release, followed by sending a command that triggers the release to disconnect itself from the anchor. The float appears on the surface momentarily and when it’s close enough the deck crew throws a grappling hook to connect the winch line to the float. The mooring is recovered onto the ship in the same order as it was deployed, which takes about an hour per mooring. After successfully recovering the three hydrophones I took a quick nap but made sure to set my alarm as to not miss the late night snack: churros! The late night snack menu was adopted for the research cruise and was enjoyed by all. The deck crew has thrown a grappling hook to retrieve the float to begin a mooring recovery. 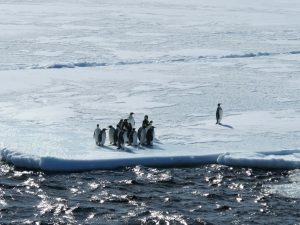 A group of emperor penguins on the south side of the Drygalski. We next began our trek south to the Ross Ice Shelf in hopes of recovering a 2-year-old KOPRI OBS (ocean bottom seismometer). The views, along with the cold, were breathtaking. After an unsuccessful search for the OBS, we made our way back north, but this time to the south side of the Drygalski. Here, the sea ice was the thickest we came across the whole trip and it was impressive to see (and hear, and feel) the Araon’s icebreaking capabilities. At the southern base of the Drygalski, another NIWA mooring was deployed and a few CTD casts located supercooled water, which is deep water that is colder than the surface freezing point and indicates melt water. During one of the CTD casts we also came across a group of curious emperor penguins that put on a great show for us. The Ross Ice Shelf- the largest ice shelf of Antarctica. Breaking sea ice south of the Drygalski Ice Tongue. 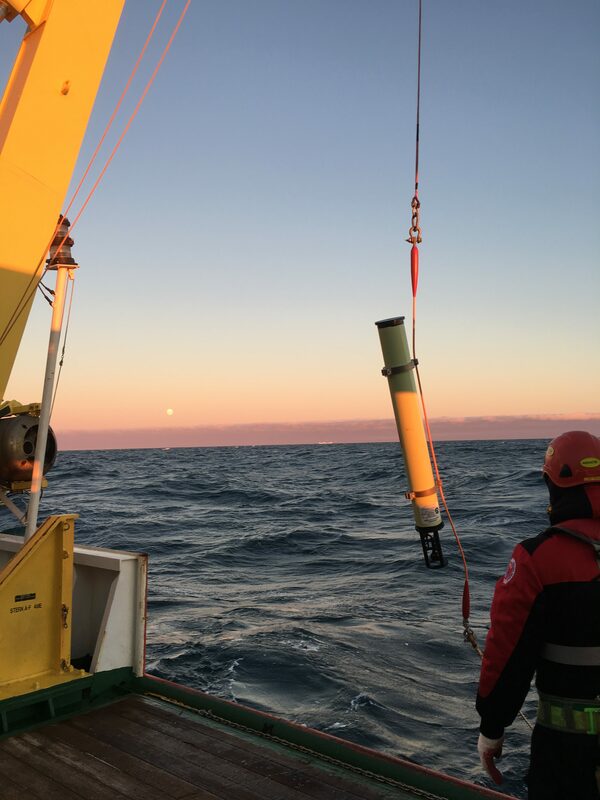 One of the last hydrophones being lowered into the water with the moonrise in the distance. 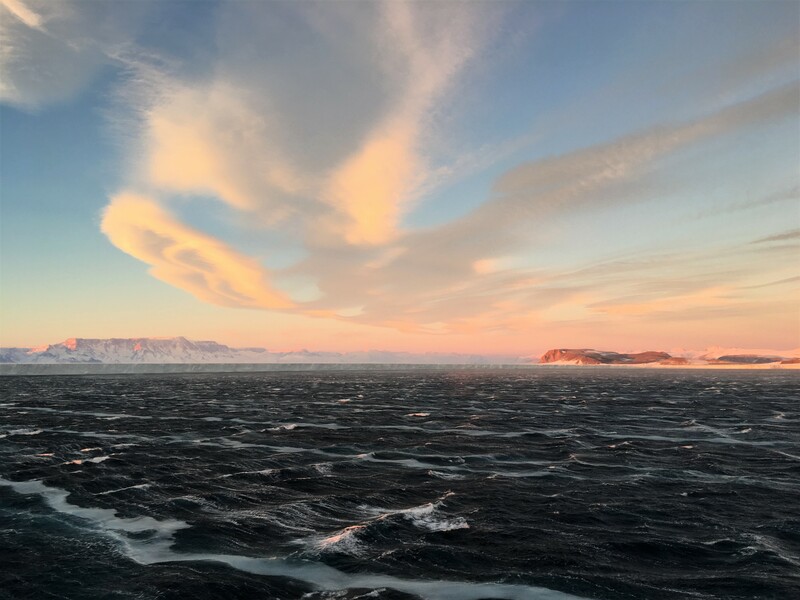 As we made our way back through the sea ice and rounded the Drygalski, we were greeted at my mooring site again by open water as well as a beautiful sunset. Although “night” ops are quite cold to work through, we were treated with being able to see the moonrise and sunset simultaneously on opposite horizons. We also discovered the Araon deck’s hand warmer! The deployment of this triad went smoothly as well, and it will be valuable to have another year’s worth of data recorded at this site. 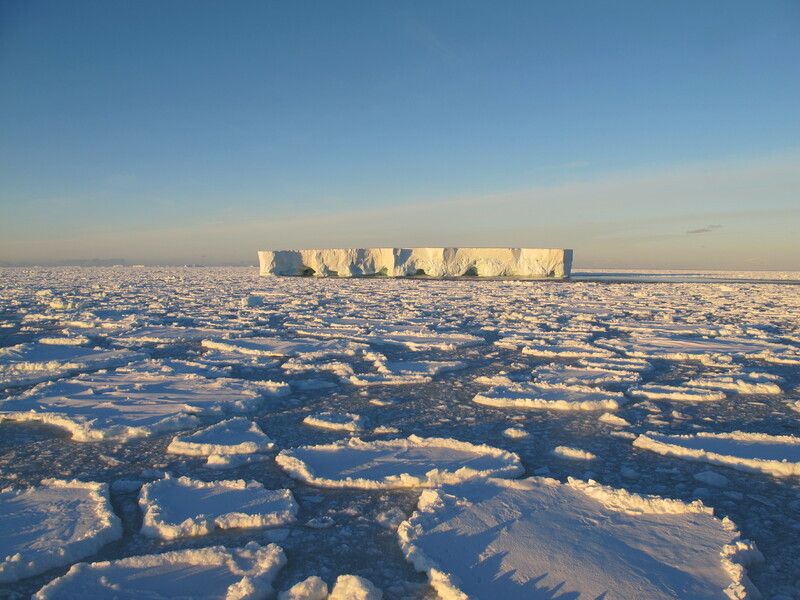 On the 14th we returned to the Nansen Ice Shelf for the final days of the research cruise. The Gavia AUV was sent on its last few dives and the next day we were bid farewell by the Nansen with 60-knot katabatic winds. On the 16th, a Thursday, we had our final night of Korean BBQ, which threw me off as I had been gauging which day of the week it was by Korean BBQ Saturdays! That night we arrived at Jang Bogo, where we spent two days bunkering and helicoptering people and cargo. It was great to welcome back the people we had dropped off last month to do land-based operations, as well as see new faces who had been stationed at Jang Bogo for the austral summer. We then made one more stop in Robertson Bay to recover some NIWA moorings and take in our last views of Antarctica before a week of ocean. We are now officially on our way home, and what an adventure it’s been. The departure is bittersweet, especially for us first-timers, but I am feeling extremely grateful to have been sent to this wild, beautiful continent. This past week was filled with stormy seas, cruise reports, packing, and the last few servings of Araon kimchi. I am looking forward to meeting the hydrophones back in Newport and finding out what they have recorded this past year in Terra Nova Bay. Stay tuned! Katabatic winds blowing at 60 knots off the Nansen Ice Shelf. Sea ice begins to form on the ocean surface in lines parallel to wind flow. The anchors and me on the helideck of the IBRV Araon. Lauren here, the lab’s new mooring technician. Originally from Redondo Beach, CA, I moved out to Newport from Portland this past September. My background is in bioacoustics and more recently, fisheries, and I will be deploying, recovering, and building the hydrophones for the PMEL Acoustics Program. 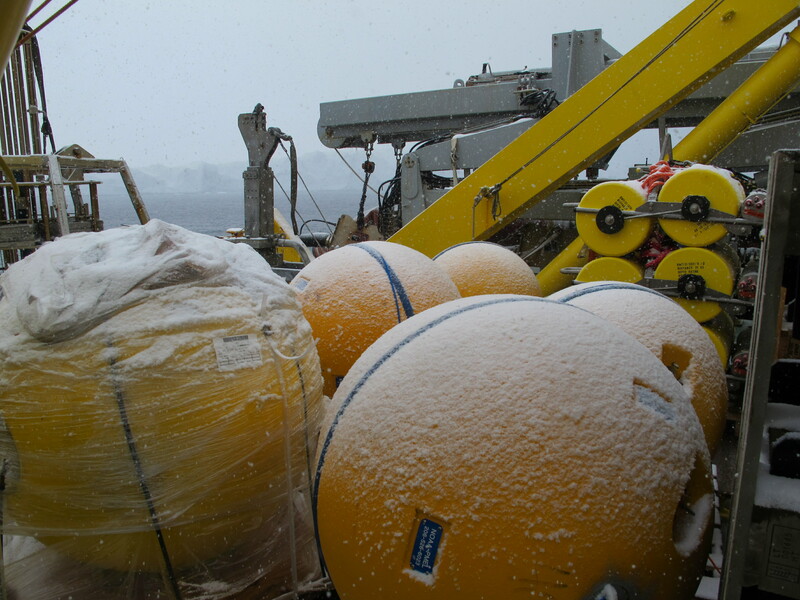 Our syntactic foam floats received a blanket of snow as we arrived in Terra Nova Bay. 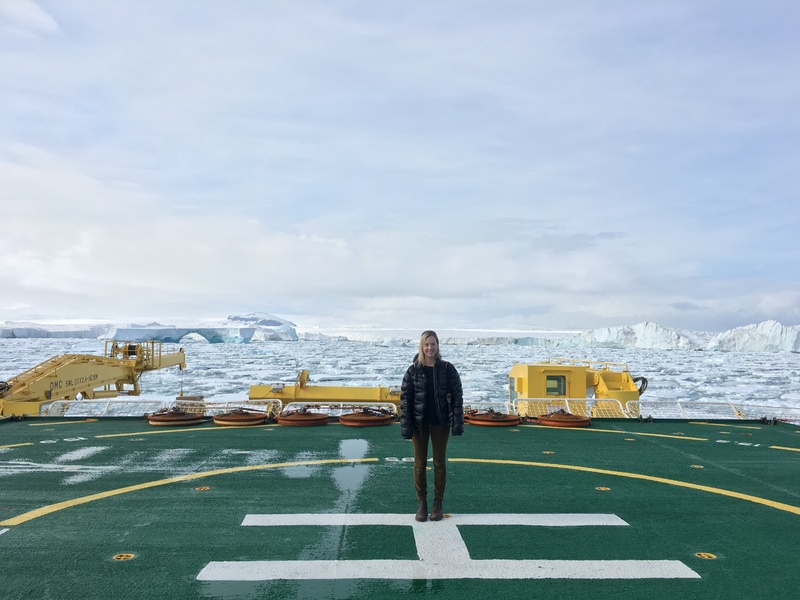 I feel very fortunate to say that my first expedition for the lab is also my first time to Antarctica. 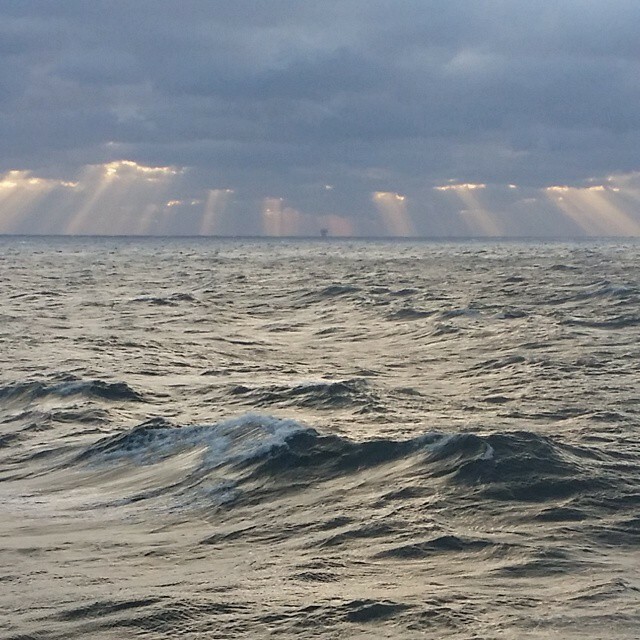 It is currently day 10 onboard the IBRV Araon and day 3 in the Ross Sea. The objective of this cruise is to use various land- and ship-based research methods to gain a thorough understanding of the Terra Nova Bay region. 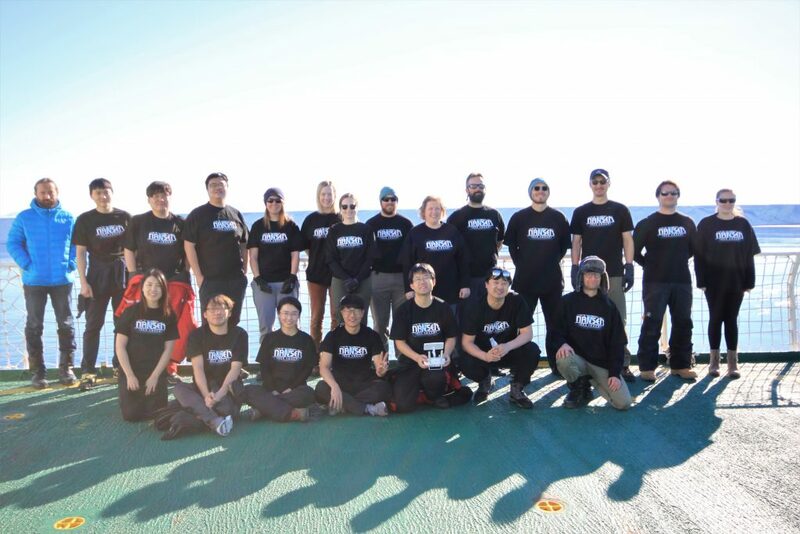 The PMEL Acoustics Program has been collaborating with the Korea Polar Research Institute (KOPRI) for several years on multiple projects in Antarctica. On this trip I will be replacing a hydrophone triad near the Drygalski Ice Tongue that has been replaced annually for the last three years as well as deploy a second triad in a new location further north. The data collected from these deployments will allow us to characterize the soundscape of the Terra Nova Bay polynya. Although I landed in New Zealand January 17th, the planning for this trip began months before my arrival. In October we built and shipped the hydrophones along with 11,000 pounds of mooring equipment. I also went up to Seattle for training, booked six flights, packed for two months at sea, and did lots of paperwork. After more than 24 hours of travel, I landed in Christchurch and was pleasantly surprised to run into the KOPRI team at the baggage claim. It was great to finally meet the people I had been emailing with. I spent the next two days at the port in nearby Lyttelton confirming that all of the equipment had arrived and was in working condition. One of the six hydrophones I will be deploying. The strongback being attached to the pressure housing here will hold the instrument in line with the mooring. We departed the Lyttelton port at noon on January 20th. 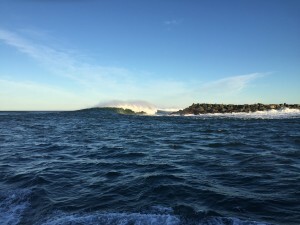 Our 8-day transit to the Southern Ocean had a few rough days but was an easy one according to the veterans. I set up my work area in the geology lab, which I am sharing with a team from UC Davis who will be deploying a glider, AUV, and ROV under the Nansen Ice Shelf. I secured my equipment, set up the GPS antenna, and attached the remaining strongbacks to the hydrophones. I have also been working with the chief scientist, chief bosun, and other mooring groups to strategize for safe and successful recoveries and deployments. Aside from science preparations, life onboard has been an easy and enjoyable adjustment. The Araon crew, KOPRI scientists, and foreign scientists are a wonderful group of people and it has been fascinating learning about their work. The food and quarters are great, the landscape is stunning, and there’s ping pong! This past weekend we enjoyed a feast to celebrate the Korean New Year. As we continued south, the nights changed from short to nonexistent. We were greeted by a snowstorm upon arrival at Jang Bogo station on the 26th. The initial plan of refueling the station was aborted as the Araon became surrounded by sea ice. 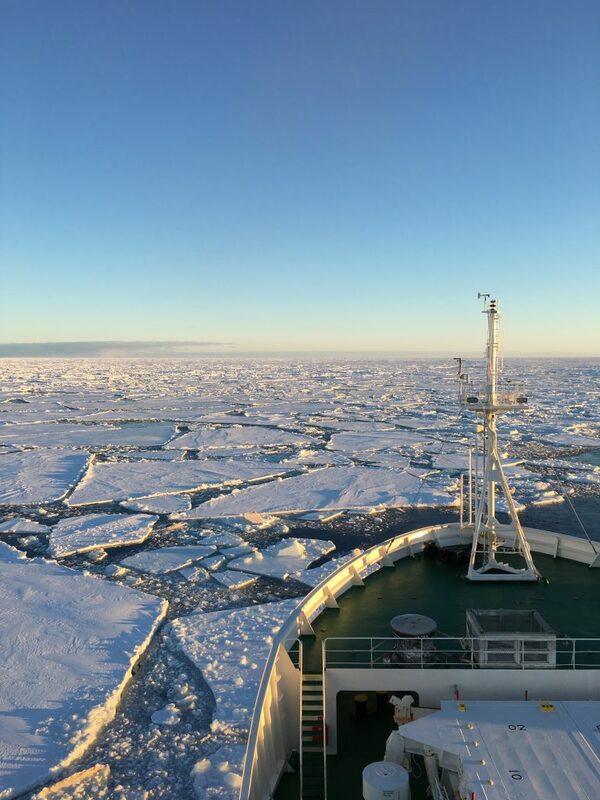 Instead, crew and cargo were helicoptered back and forth and we started the research cruise today with the hope that the sea ice conditions will be favorable for bunkering when we return in three weeks. The first two days of the research will be spent multibeaming the seafloor near Jang Bogo, and if all goes as planned, our first hydrophone triad will be in the water a week from tomorrow. I hope to report back then of a successful deployment, pending internet. 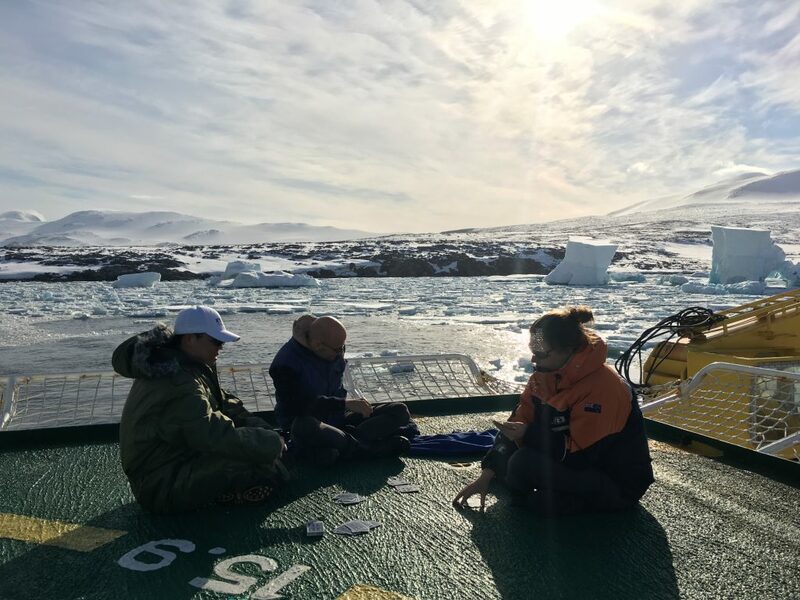 Xianwei, Florian, and Fiona taking advantage of some sunshine while anchored at Jang Bogo station. Last year our program embarked on an exciting new project to capture the soundscape from the deepest ocean abyss. At nearly 11 km, Challenger Deep is a unique hadal zone located in the southern portion of the Mariana Trench in the western Pacific. The remoteness of the area combined with pressures reaching 16,000 psi and temperatures near freezing, have maintained the mysterious nature of Challenger Deep. 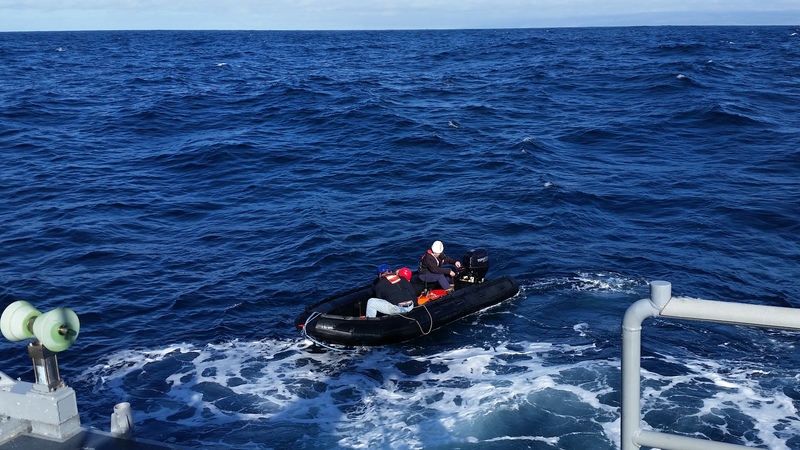 Earlier posts describing details from our expeditions outline some of the adventures and challenges we encountered along the way to a successful three week long, continuous underwater acoustic recording in the deepest point on Earth. Top pair of floats going in. In March 2016 the National Oceanic and Atmospheric Administration released audio captured by a specially designed hydrophone that had been lowered very slowly to the deepest part of the Mariana Trench, an area called Challenger Deep. The recordings revealed a surprising amount of noise both from the ocean floor and carried underwater from miles away. Mariana uses Max to process the original NOAA audio, freeze a series of tiny grains of sound (approximately .01 of a second) and apply a shaped envelope to it. This is looped and repeated quickly to make it resemble one continuous drone. 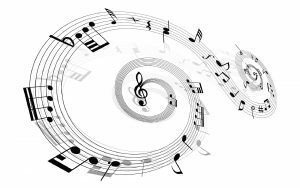 The granularity forces the ear to isolate just a few pitches at different hierarchies, but because of the nature of organic sound the complexity of these drones can be phenomenal. The singer gives voice to Tennyson’s 1830 poem of despondent isolation and hopeless abandonment by carefully listening to the drones, determining a fundamental, overtones, and timbre and following a score written intervallically relative to characteristics of the surrounding sound world. An experiment in both responsive and intentionally non-responsive interplay between human and generated sound, each performance will be vastly different as it is practically impossible to recreate a drone exactly after it is passed and singers may perceive the same drone with slightly different sonic hierarchy. Costas also sent along a rough score (click the link below) of the piece that was performed at the workshop in San Francisco in May 2016. A beautiful example of the synergy that exists between art and science. Thank you Costas for sharing your art and inspiration. I have been fascinated by the ocean for as long as I can remember. 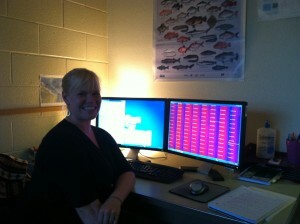 I grew up determined to work in Marine Science. I received my bachelor’s in Marine Science from Coastal Carolina University. I lived off the coast of South Carolina and it was my first real coastal experience having been raised in Ohio. After I graduated, I started my career in Alaska as a fisheries observer. My first at-sea experience was on an ex-cargo ship that was converted into a mothership. It was massive with a length around 680ft. I don’t think one ever forgets their first vessel. For a year and a half, I worked in the Bering Sea on various vessels collecting fisheries data for the National Marine Fisheries Service. With my offshore experience in Alaska, I was awarded a temporary contract with the Integrated Ocean Drilling Program (IODP), the successor of the Deep Sea Drilling Project (DSDP). I had read about DSDP in my college text books, and I felt like I was working with scientific elites. 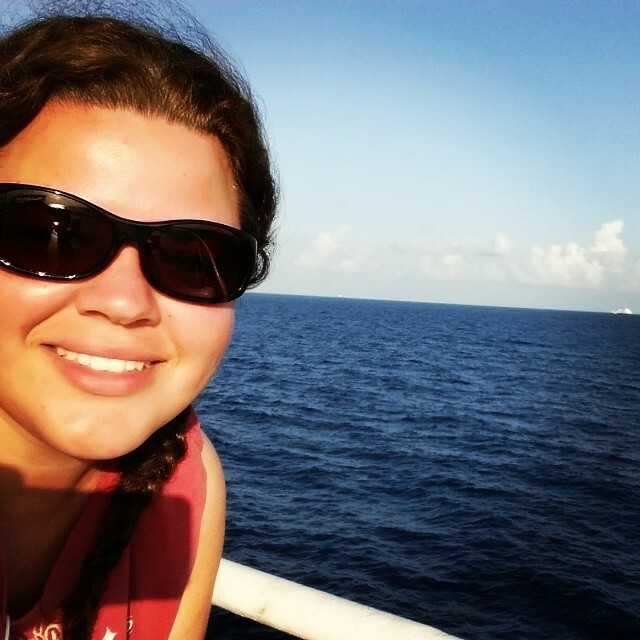 The expedition for this IODP leg was in the Caribbean Sea. They drilled thousands of meters into volcanic rock pulling up cores of the lithosphere that would reveal millions of years of history. Enjoying my experiences in warmer climates, my work shifted to seismic survey ships for the oil and gas industry in the Gulf of Mexico. Seismic ships towed six miles of hydrophone cables while air guns exploded on varied second intervals. The ships traveled in transects for months (mowing the lawn they’d say) collecting information from beneath the sea floor. The sonic blasts from the air guns can be fatal to marine life. 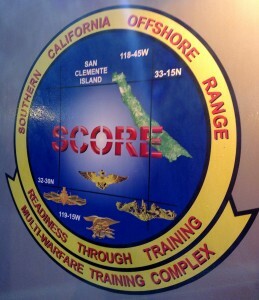 I monitored operations for protected marine species. When a protected animal entered the exclusion zone, it was my responsibility to shut down production. My experience in seismic survey readied me for a major contract working on the Shell Prospect as a protected species observer in the Chukchi Sea. I sailed on a small supply vessel from Dutch Harbor, Alaska over a thousand miles to the Arctic Ocean. Straddling the International Date Line, I could see Siberia from the ship. One night during transit in Kotzebue Sound, I saw a beam of green waterfalls across the night sky. It was my first time seeing the Aurora Borealis. 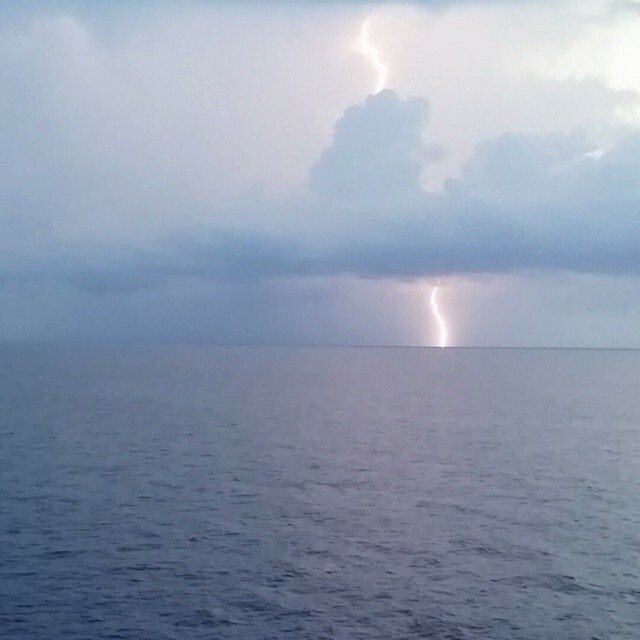 In over 500 sea days of experience, I have found there is a camaraderie earned from working at sea. Solid friendships were made with people I spent only a few weeks or one contract with. My network of contacts and friends are from all over the world: many languages fill my Facebook newsfeed. I was granted a position with the Pacific Marine Environmental Laboratory (PMEL) in their Acoustics program. I recently relocated from Columbus, Ohio for this incredible opportunity. 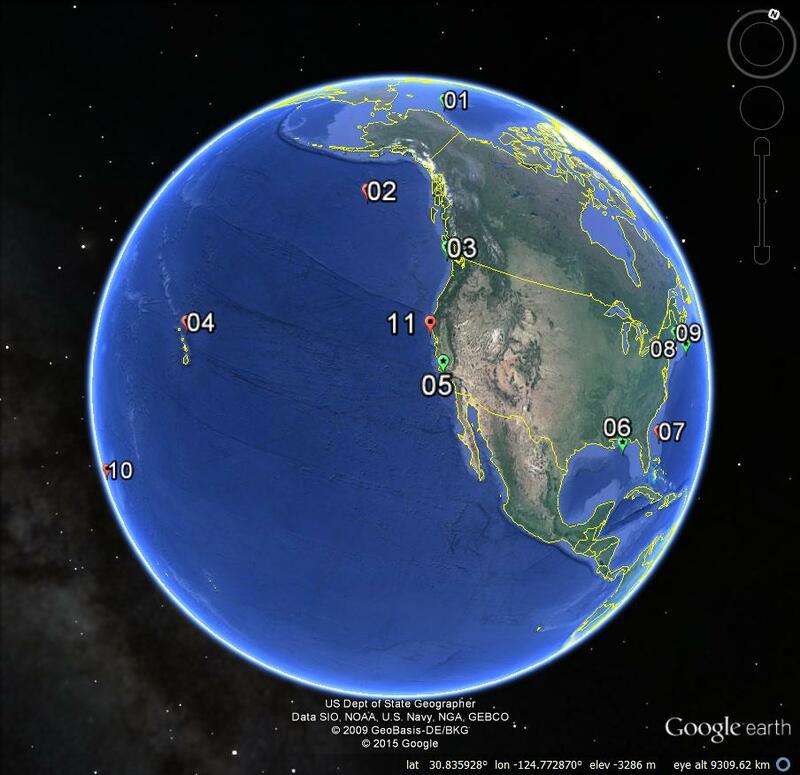 I will be working at the lab here in Newport, OR and at sea for deployments switching out hydrophones around the world: I am ecstatic! As much as I’ve seen and done, I still feel humbled seeing ships come into port. 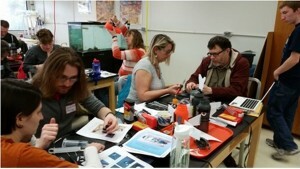 How 20 teachers turned ordinary water bottles into spry mini seagliders. This post comes to us from Sara Heimlich. From this….to this….bottle to glider in one day! Changes in marine mammal distribution and abundance, caused by environmental stresses or human activities, can have a major impact on the function of the entire deepwater ecosystem. One of the research projects being conducted by staff at the PMEL acoustics group is looking at exactly this topic in the Gulf of Mexico (GoM). LADC-GEMM (Littoral Acoustic Demonstration Center-Gulf Ecological Monitoring and Modeling) is a multidisciplinary and multi-institutional effort, using expertise from marine acoustics, biology, physics, engineering, mathematics, and computational predictive modeling, with the aim of understanding of how the regional marine mammal population in the northern GoM has been affected by the 2010 Deepwater Horizon (DWH) oil spill. The research and science behind projects like LADC-GEMM can often seem high-brow, inaccessible, and even confusing. 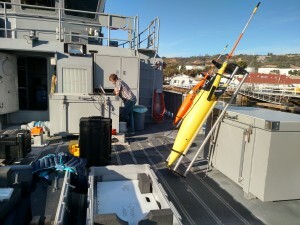 So, one of the ways the LADC-GEMM project aims to demystify ocean science is by using the popularity of robotic ocean gliders – like our charismatic “Otis” and “Clyde”- to engage teachers and students in exploring many of the essential skills and principles of the kind of work that is becoming more commonplace in the marine sector. Alex Turpin, Staff Scientist and Selene Fergosi, PhD. student help a teacher with the electronic parts for his model glider. “What are underwater gliders and how are they used by scientists to study the ocean and its inhabitants?” is a simple question that opens up many avenues for exploration. But the most fun and accessible is actually building a working model of a seaglider. Recently, 20 elementary through high school, in and out-of-school educators from around the state of Oregon came to the Hatfield Marine Science Center in Newport, Oregon to spend a Saturday doing just that. During the SeaGlide Educator Workshop, they also heard directly from David K. Mellinger, Haru Matumoto, Sharon Nieukirk, Sara Heimlich, Alex Turpin and Selene Fergosi about how gliders are being used in their research. The workshop, organized with the help of Tracy Crews at HMSC’S Oreon Coast STEM Hub, also provided a presentation by Toledo, Oregon high school students. 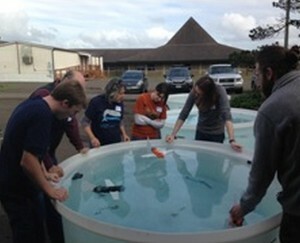 These juniors and seniors had already spent a school term building their own simple models and analyzing real data collected by gliders used in field work conducted for the Oceans Observatories Initiative (OOI), provided by Jon Fram of Oregon State University’s College of Earth ocean and Atmospheric Sciences (CEOAS). 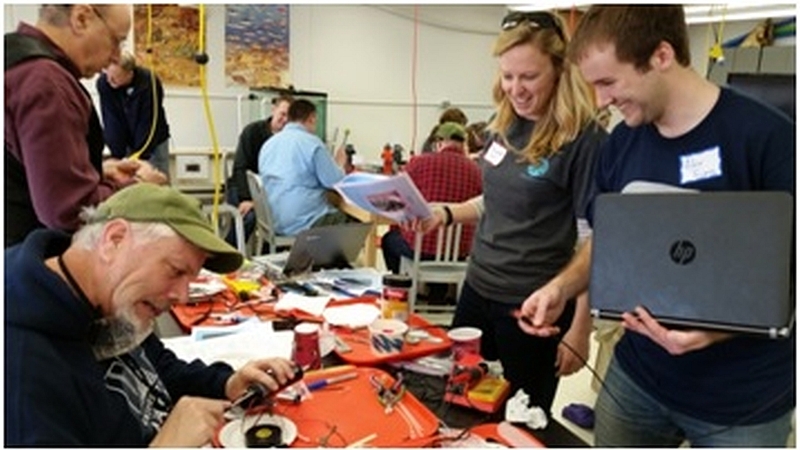 This gave the Seaglide workshop participants the opportunity to see how curricula can be developed around this engaging STEM activity, either in a classroom or for after-school programs. 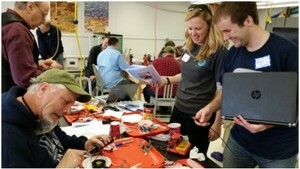 Educators putting the finishing touches on the body of their model gliders. The seagliders built during the workshop used designs and instructions developed by Michael Britt-Crane at Seaglide.net. SeaGlide was originally designed for high school students. It moves by changing its buoyancy, taking in or expelling water. This change in buoyancy causes the glider to rise and sink in the water. As the glider travels up and down, its wings generate lift, which propels the glider forward. SeaGlide can’t run for months at a time like real gliders, but it can collect temperature and pressure data as it ‘flies’ through the water. For the workshop participants, the hands-on experience of building their own Seaglider with the help of mentors (several were local members of the high school robotics club) proved to be the most valuable part of the day. The majority walked away from the workshop feeling confident in facilitating this STEM learning experience, and being able to teach students about the science, technology, engineering and math aspects. Some plan to incorporate gliders in curriculum as part of a course in the school system, some in an after school club or activity, and a few as a summer program. SeaGlide workshops are being organized by PMEL staff working with LADC-GEMM consortium members for 2016 and 2017, in Mississippi and other “Gulf States”. Workshop Instructors. Back row: staff scientists David K. Mellinger, Selene Fergosi, Alex Turpin. Front row: staff scientists Sharon Nieukirk, Sara Heimlich and STEM program staff Tracey Crews. Haru Matsumoto is missing from this photo. I haven’t posted in a while, so lets touch base on the last three months of my grad school life. Michelle mentioned that many in our lab attended the Biennial Meeting for the Society for Marine Mammalogy. I too was there, and it was crazy, but awesome. I gave a talk on my master’s work and was the most nervous I have ever been to give a talk…biggest audience, TWO screens, up on a podium. EEK. I think it went ok though. 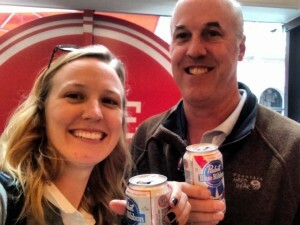 And the best part of all was that my dad snuck in to watch. And more importantly he refrained from asking a question and embarrassing me. 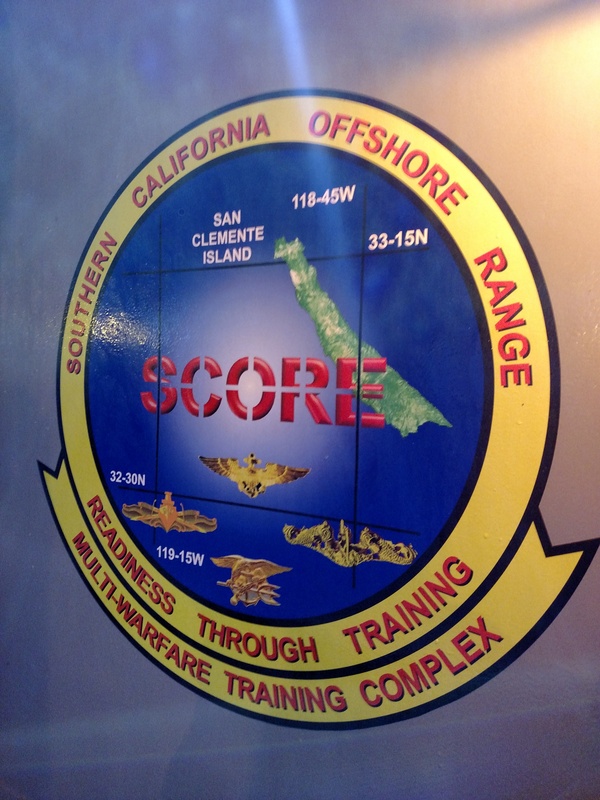 Deployment – Dec 20. 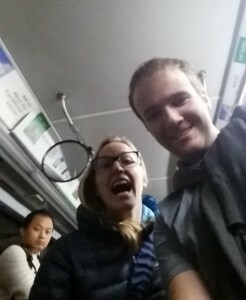 Right after the marine mammal conference, I went home to my parents house for a day, then flew down to San Diego, Haru, Alex, and I went out on the deployment, and things went mostly as expected. We were only able to deploy one glider because one had an antenna issue, but we also got two floats out. Yay! Recovery – Scheduled for Jan 4. Alex and I were slated to fly down from Portland to San Diego, head out early in the morning on the 4th (it takes us about 7 hours by boat to get to where the stuff was), and try to find the glider, that will surface for about 15 mins, every 5 hours, in 12 foot seas, within 2 km of a particular point. Wake up Sunday morning, Alex is going to drive from Newport to Corvallis in our rental car, so we can drive to the airport for our midday flight. Guess what. It snowed. Our rental car wouldn’t make it over the coast range. SO. We reschedule our flight for later. Alex gets a ride over the hill from Haru, who has a truck. We take my Subaru to the airport. WORST DRIVE EVER. 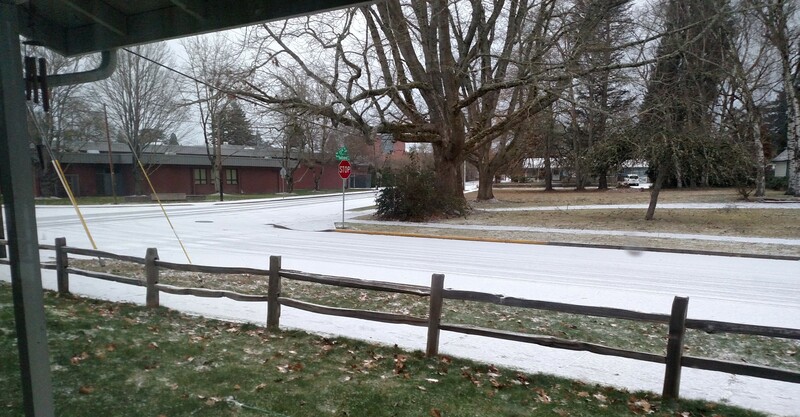 Corvallis snow melted, Portland was in a full on ice storm. Cars sliding off the road everywhere, somehow we make it (Thank you Remy Lebeau…my car). Oh but wait, halfway there, I get a text message that our flight has been cancelled. Alaska automatically re-routes me: Portland to LA, LA to Seattle, Seattle to San Diego..midday on the 4th. REMEMBER we need to get our stuff on the 4th. The weather forecast has gotten worse for later in the week…Monday is our only chance. Oh and bonus, Alex got rerouted as well…for Tuesday the 5th, at 7pm, direct flight Portland to San Diego. SUPER GREAT! Plus..serious shout out to Alex, best glider tech/pilot/friend I could have out there. 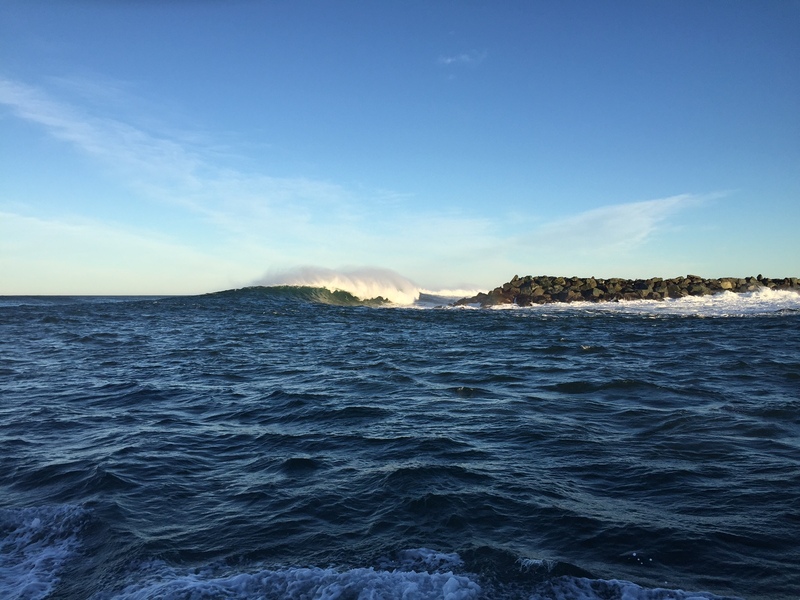 Waves breaking off the north jetty tip of the Yaquina Bay bar. baseline soundscape characterization and ambient noise levels for permit and licensing authorization of a U.S. Department of Energy sponsored wave energy converter testing facility (NNMREC – SETS) off Newport, OR (click here for previous blog post and more info). 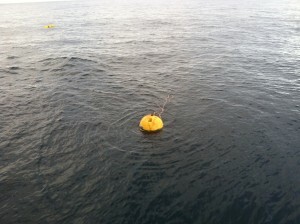 The mooring was placed in an area designated by local fisherman (Fisherman Interested in Natural Energy – FINE) having the least impact on fishing activities, but meeting the criteria needed for a shore cabled wave energy testing facility. Despite this designation, the area is still heavily used by the commercial and sport fishing communities seeing high levels of seasonal commercial crabbing activity in particular. So, I really wanted to get the mooring recovered before the Oregon commercial crabbing season opened in January of this year. With that in mind, the OSU coastal research vessel we typically use for this and other local work offshore has been out of commission for months. On top of that, we had one of the most “stormy” December’s on record with high waves and winds lasting throughout most of the month. During one stretch, the significant wave heights at the Stonewall Bank Buoy stayed up around 7-8 m and higher for more than a week! 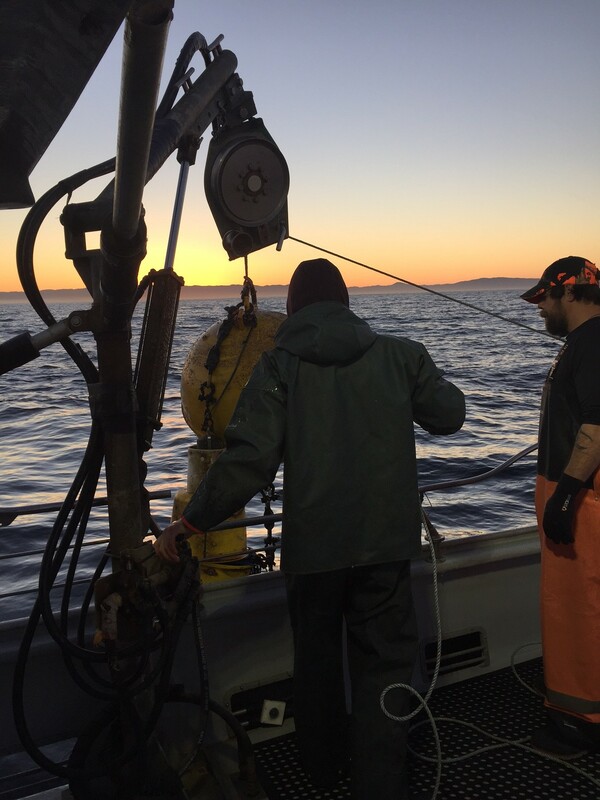 Recovering the hydrophone mooring during sunrise off Newport. I was scrambling to find a vessel and crew for the recovery, when a friend put me in touch with the F/V Enterprise whose Captain and crew were busy commercial crabbing but said they’d be happy to take me out in between trips. A weather window opened up and we slid out the jaws of the Yaquina at 0630 just as the sun was starting to shed light over the coast range. 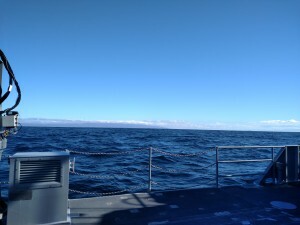 The Captain put the hammer down and we made quick time out to the mooring station at 17 knots! I was amazed and starting to get nervous by the amount of crab gear in the water on the way out and around the area where the mooring was deployed back in June. 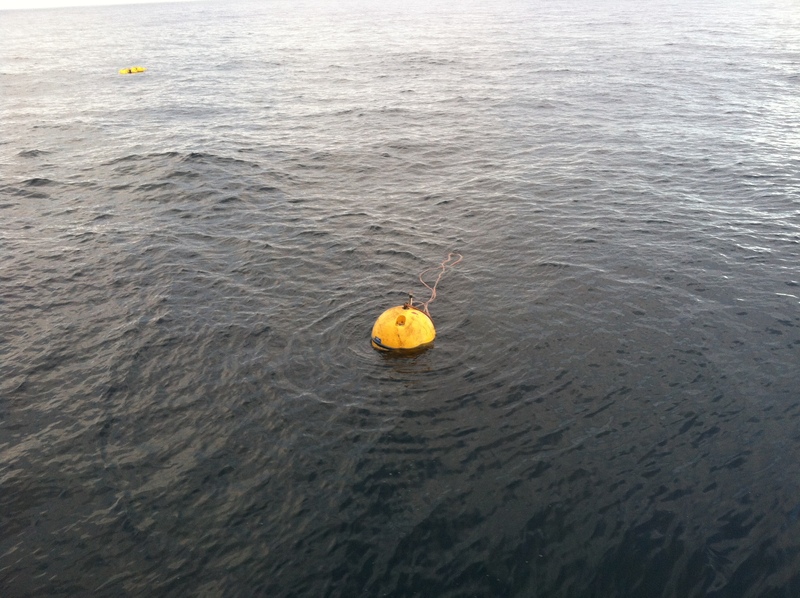 One of the great things about our hydrophone mooring is that there is no buoy or surface float to indicate its position. Ships working or traveling through the area have no idea anything is below them. For recovery of the equipment, we are reliant on an acoustic release that when triggered from an acoustic cue at the surface, releases a submerged float bringing the mooring to the surface. offshore work. Talking with the crew and watching the sunrise from the water reminded me of how awesome the work we do really is. The day to day office and computer work are a necessary and often exciting part of the bigger picture, but for me, the time on the water and field experiences really bring home the value and privilege it is to get to follow my interests in studying the ocean and earth for a living. Courtney has joined our team and will be processing acoustic data, managing our social media, and other assignments around the lab. She is working in Rm 114 next to Brian K. most afternoons. Stop by and say hi! 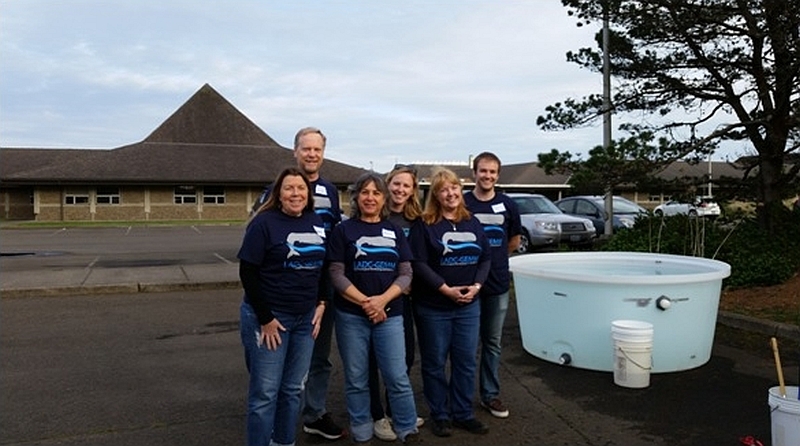 I have worked many jobs in Newport, Oregon, from bartending to jewelry sales to working in the judicial system, but none of them had me thinking that someday I would work at Hatfield Marine Science Center. As a local for many years, I have had the opportunity to get to know some of the scientists who work here, and have had many visits to the museum with my six year old. I have always wanted to work in the brown buildings I see as I cross the bridge, and by a stroke of luck, here I am. This incredible opportunity has many wonderful aspects to it, including environmental awareness, the chance to network with some incredible people, the sense of pride that comes from telling my son I work here, and, honestly, a little peace and quiet. I have a very inquisitive son named Lochlan. Together he and I like to explore the world around us by going on hikes, fossil hunting at the beach, and visits to the Oregon Coast Aquarium and the Hatfield Marine Science Center. We have a great time learning about our Earth, and to be able to explore it in this new way is very exciting, and something he and I can both be proud of. While there are many wonderful things about this new job, my favorite part might very well be the chance to plunge deep under the sea and slow down for a moment. While the data I will be going through may represent some pretty tumultuous stuff going on down there, up here it is an opportunity to quiet down, turn on some classical music, and tap into the calm that I just know is in there. I look forward to sitting at my desk each day to escape life’s highway and take a more scenic route through the waters for a while. 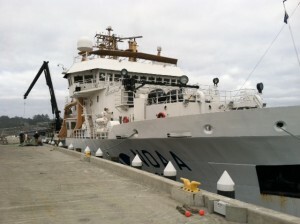 NOAA ship Bell Shimada at port in Newport, OR. since I was able to load the ship in Newport before they departed for Alaska and wouldn’t have to travel or ship a bunch of luggage, tools, etc., including a 3400 lb. trawl resistant concrete anchor! On an early Sunday morning I flew up to Ketchikan to spend the next day or two waiting to board the ship as they finished their mission. Let me just say Ketchikan is wet. Having lived on the Oregon coast for over a decade I thought I knew about rain. From the time I landed in the airport until we crossed back in to U.S. waters heading south 4 days later, it rained. No breaks. Just rain. A few locals told me they see around 200 inches of rain a year. 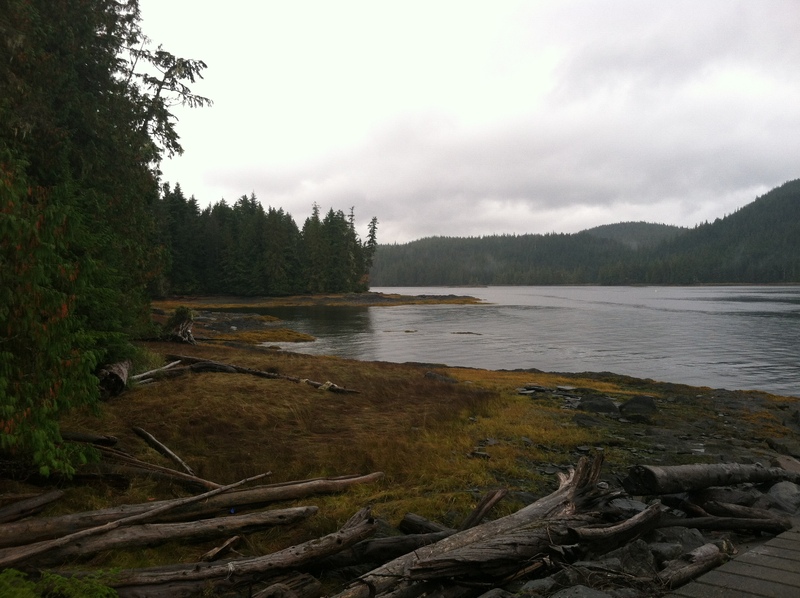 That is a lot of water, and why SE Alaska is a phenomenally green and beautiful landscape. At the same time, it gave me a new appreciation for dryer climates back home in Newport, OR. 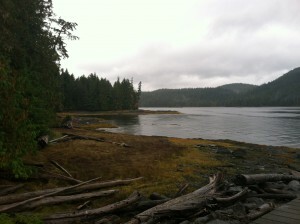 The lush green shores of Ketchikan, AK where I walked the same small 15 acre island 5 times a day. After the science crew from the previous mission disembarked, I boarded the Shimada from a small transfer vessel in the dark hours of the morning and the ship began heading south. That evening, as the skies began to clear, we came across a large group of humpback whales in Hecate Strait just to the east of Graham Island. By a large group, I mean more whales than I could imagine in one spot. They were everywhere, all sizes, with numbers in the hundreds. 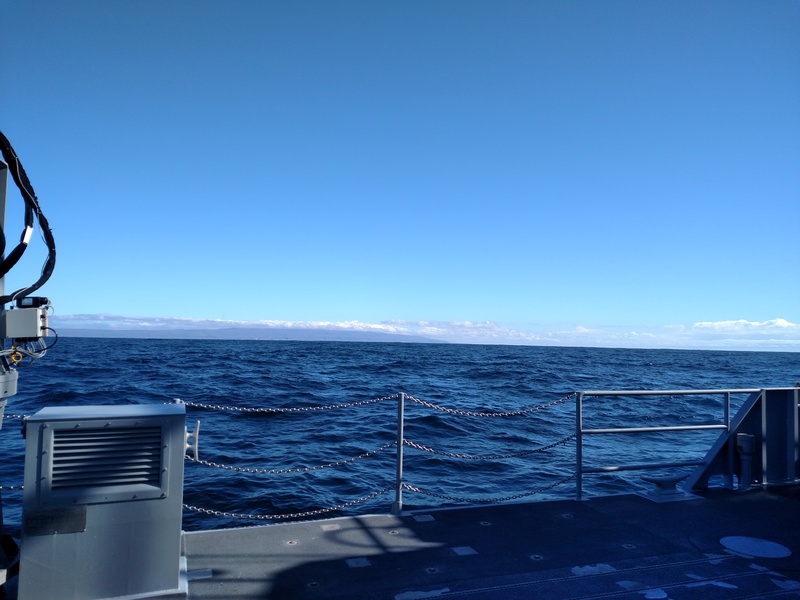 I went up to the ship’s bridge and they had slowed the Shimada down to ~ 1.5 kts and were trying to skirt the eastern edge of the whales. We opened the doors and could hear them whooping and whistling just below the surface as they fluked and lazily dove and milled around. It was awesome. 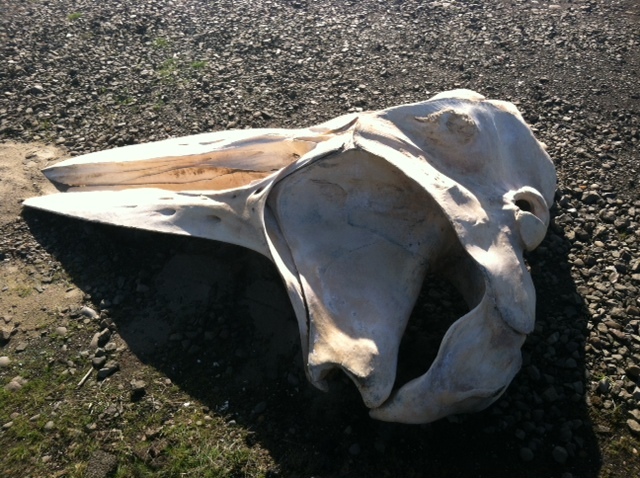 A humpback whale skull in the boatyard behind our lab that was removed off the beach south of Newport a week after I returned from this trip (skull courtesy of Jim Rice, MMI). 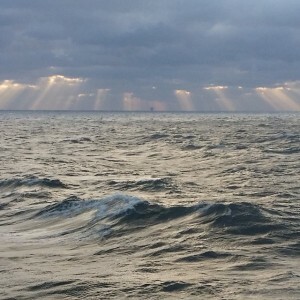 A few days later we reached the NRS 03 mooring site around sunrise. After establishing communication with the acoustic release, I “popped” the mooring and we waited for the floats to rise to the surface. This was a little different than our standard deep water moorings with extra glass floats fixed along the line down near the acoustic release due to the heavier anchor. Slightly after the big yellow syntactic foam 40 inch float reached the surface, the series of glass balls in yellow “hard hats” popped up nearby. Here’s where it gets interesting. The instrumentation and line are in a big belly loop strung between the 40″ float and the glass balls. The 40″ top float and lower glass floats before recovery. Careful not to get between those two and severe the line or catch it up in the props. 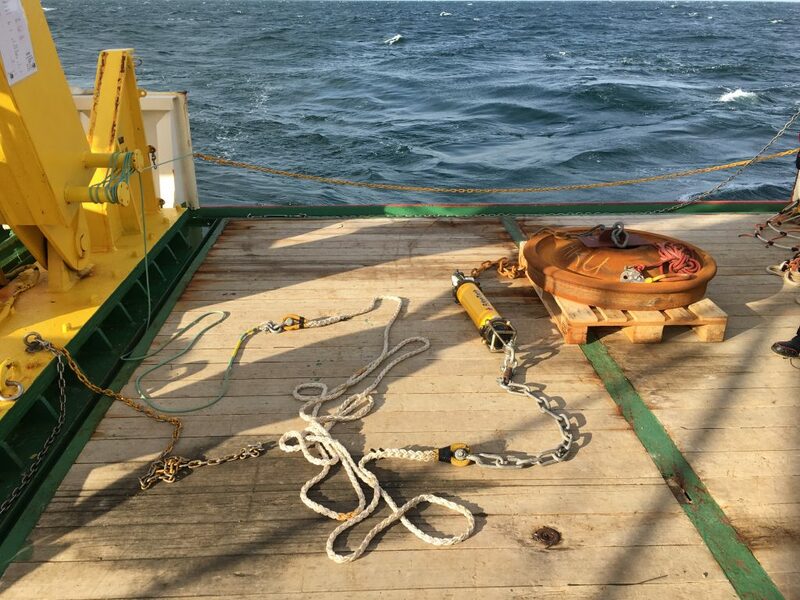 Normally on a buoy recovery, we throw grapple hooks or try to clip in to the large floating loop at the top of the mooring on the 40″ float in order to attach it to the ship’s working line and lift it on board. But on this trip we were going to do something a little different. The ship’s Chief Bosun (Bruce) has a special approach called the “Bruce Noose” where he uses the ship’s crane to create a loop that can be dropped over the buoy and then cinched up and attached to the lifting line. This technique has several advantages: 1) not throwing metal hooks at your gear; 2) don’t have to be right up on the buoy where the weather can push the buoy against the ship’s hull and damage things; 3) once cinched, you have a nice grip on the mooring and can tow it or move it around slightly before recovery. The “Bruce Noose” in action. After using the “Bruce Noose” successfully, we recovered the NRS 03 hydrophone and mooring, swapped out all of the hardware (shackles, chain, etc. 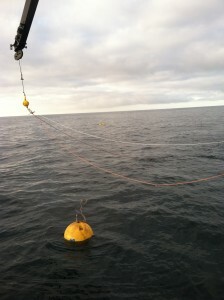 ), replaced the hydrophone, new zincs and link for the acoustic release and redeployed the mooring at the same site. It will stay out, monitoring ocean noise levels and recording all types of cool sounds for the next 2 years before it is recovered in 2017. Needless to say, the “Bruce Noose” was a great new technique to learn for buoy recoveries and something I’ll put to use on future missions. Thanks Bruce and the Captain and crew of the Bell Shimada! 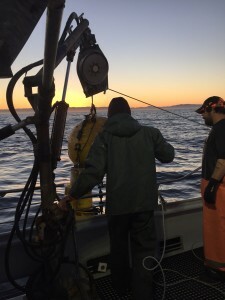 Monitoring baseline ocean noise is critically important to understand both natural and anthropogenic changes in the marine ambient sound environment. Check out this haiku by Lucia Upchurch and click on this link to find out more about our Ocean Noise Reference Station work. Posted in Other News of Interest. 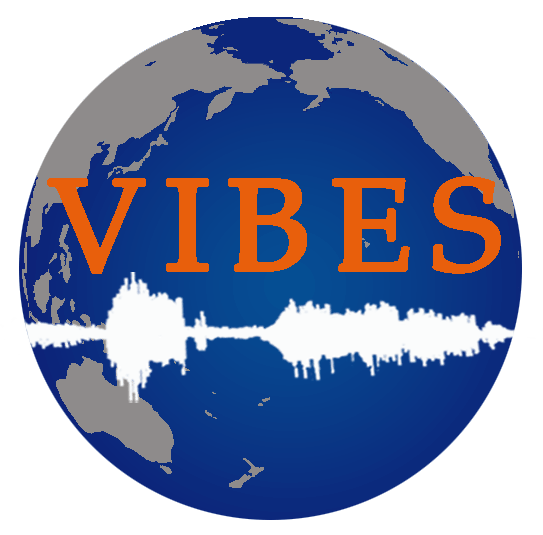 © 2019 Ocean Acoustics Program, all rights reserved. Header Photo by Matt Fowler.